People living in poverty – and especially women – are often marginalised when it comes to access to financial services. During last week’s annual ACCOSCA (African Confederation of Cooperatives Savings and Credit Associations) congress in Malawi, We Effect promoted financial services and gender equality as effective tools for fighting poverty. To overcome poverty, people need to be able to save, borrow and invest. Access to financial services puts women and men living in poverty to better position to manage their financial affairs, thus empowering them while making investment decisions. But people with little income or lack of collateral are seldom able to access loans from banks and other formal financial institutions. Therefore We Effect, together with its partner organisations, promotes microfinance, institutions such as community based SACCO (Savings and credit cooperatives) and Group Saving and Loans Associations (GSLA). Through these financial services, people can safeguard their savings, obtain small loans and improve their lives. In Malawi, We Effect is partnering with Malawi Union of Savings and Credit Cooperatives (MUSCCO) to implement the financial services, within the Malawi Lake Basin Programme (MLBP)*. – Together with our partners, we promote member owned finance institutions that can break the glass ceiling for smallholder farmers living in poverty to access financial services, says Sanne Chipeta, We Effect Country Representative for Malawi and Programme Director for MLBP. 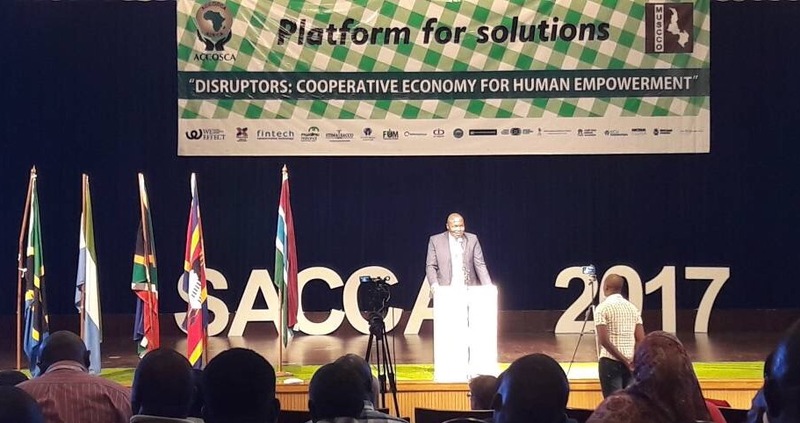 During last week’s ACCOSCA congress, with the theme being “Disruptors: Cooperative economy for human development”, cooperatives and farmer leaders that We Effect work with had the opportunity to learn from, and exchange experiences with, other SACCO members from the rest of the African continent – as well as from the US, Canada and Ireland. Since women are particularly disadvantaged when it comes to access to formal financial services, the financial services promoted by We Effect and partners are very popular among rural women. – It is however challenging for women to access and make good use of the services, since it is often difficult for women to have adequate access and control over their own income, says Sanne Chipeta. We Effect, together with its local partner organisations, therefore also promote gender equality awareness, whereby the households learn to work together towards a common vision and action for joint decision on the utilisation of resources. – Gender equality in access to financial services strengthens women’s economic decisions and leads to social and political empowerment, says Jennipher Sakala, from We Effect Regional Office. At last week’s congress, We Effect particularly brought in the aspects of inclusion, gender equality and rural based credit cooperatives. During a We Effect facilitated workshop on gender equality and financial inclusion, four women from MLBP – all from Salima in Malawi and members of MUFUNA SACCO – shared their stories on successes and challenges in accessing financial services. The four women’s stories provided a platform for in-depth discussions, provoking and challenging the minds of the international delegates as to why women are seldom included and what needs to be done to change this. The testimonies of the women from Malawi, as well as challenges faced by other women in Africa, were presented to ACCOSCA board for action. During the congress, We Effect was highly recognised as strongly advancing the gender equality and financial inclusion agenda in Africa. – We see it as a big success that from this year onwards ACCOSCA has adopted the gender equality agenda as part of the annual congress and ongoing work, says Jennipher Sakala. *Malawi Lake Basin Programme (MLBP) is a consortium of five partners, namely We Effect, Vi Agroforestry, Malawi Union of Savings and Credit Cooperatives (MUSCCO), National Smallholder Farmers’ Association of Malawi (NASFAM) and Farmers Union of Malawi (FUM). The African Confederation of Cooperatives Savings and Credit Associations (ACCOSCA) is an apex body of SACCOs in Africa, which is mandated to champion financial inclusion and improved livelihoods in Africa through the cooperative business model. ACCOSCA seeks to do that by; capacity building SACCOs, giving technical assistance, advocacy, research and business development. ACCOSCA carries out its congress annually in October, this year’s meetings being the 18th. The congress servers as an education programme where the capacity of delegates is enhanced. It is a platform where experiences on successes and challenges are shared, so as to pave the way forward for cooperative development. This year’s congress had 500 participants from 21 countries and was hosted by MUSCCO in Malawi.